The main character of TSARINA, Natalya, has a beautiful love story with none other than Alexei Romanov, the heir to the Russian throne. The sad truth is, Alexei was a little young (he died when he was about 13) to have a love story of his own. BUT…his older sister Tatiana had a beautiful one. Tatiana was the second oldest sister— born after Olga but before Maria and Anastasia. Like the rest of the Romanov children, she was super super sheltered. Lots of people like to blame royalty for wasting money and living in luxury and generally being fancy, but the truth is, lots of royals— especially women, and especially young women— had no idea what money was. Why would you, when you’d never been allowed to go to a store, when you’ve never shopped for groceries, and when everything simply arrives at your house, all boxed up and lovely? Once when they were teens, Tatiana and Olga decided to sneak away and go shopping. They got to the store and looked around, but realized 1) they didn’t have any money and 2) they had no idea how to use it anyway. The ended up having to ask someone exactly how this whole paying-for-things system worked. Tatiana, Olga, and their mother Alexandra all worked as Red Cross nurses during World War I, and convinced lots of other nobles girls too as well. This wasn’t some sort of PR thing— they were legit nurses. Tatiana even was asked to take on some nurses duties when they were in captivity, before they were executed, and was often mad that senior nurses were hesitant to let her do some of the dirtier jobs. BUT, back to the love story. There was lots of speculation who Tatiana would marry. When she was 16, the Serbian king tried to convince Tsar Nicholas to marry Tatiana off to him, but Nicholas wouldn’t do it because she was so young. Then, during her stint as a nurse, along came Dmitri Malama. Dmitri was a calvary officer. A wounded calvary officer, who had recently gotten an award for gallantry. And Tatiana was his nurse. 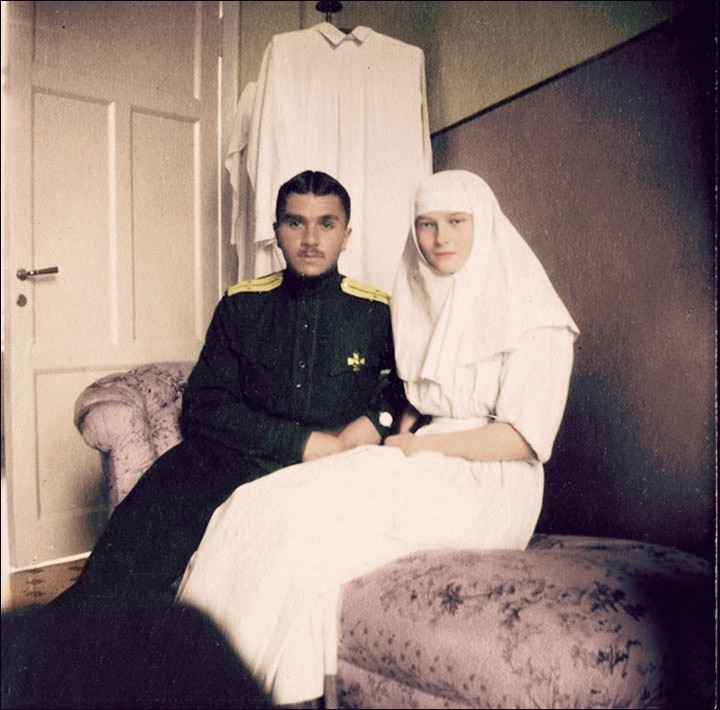 They fell in love while Dmitri was recovering from his wounds, and their relationship continued when Dmitri would up working for the Tsar at the palace in Tsarskoye Selo. They wrote each other all sorts of letters, and Dmitri got her a French Bulldog. That’s right. He got her a puppy. Smooth move, Dmitri. Obviously, she adored the puppy (his name was Ortino), and her parents were pretty pleased that such a nice guy was after their daughter’s heart. Alexandra wasn’t so sure they’d actually be able to allow Tatiana to marry Dmitri, since being a Russian princess, she really needed to marry a foreign prince (especially since the war meant Russia needed some political alliances). Still, though, everyone adored Dmitri, and he came over for dinner and visited them and it was all just adorable and sweet. When the first puppy died, he actually got her another puppy, because clearly the whole puppy-giving thing was working well for him. Of course, they didn’t end up getting married or running away together to live in a land of puppies and sunflowers because the Revolution ended up taking both their lives in the end— Tatiana’s in the basement in Ekaterinberg and Dmitri’s a year later as he lead a group of Whites against the Reds in the Ukraine. But let’s not think about that, guys. Let’s just remember the puppy. I love the songs. The songs are fabulous and catchy. And Unfortunate Souls is the BEST villain song ever. I love this movie despite it’s lies and it did drive me to learn more about the real Anastasia because I knew the movie’s story couldn’t be real but I didn’t go very far in my research all those years ago. I didn’t have a home computer or high speed internet (or a library card) and by the time I did I had moved on to other things. I accidentally commented on the wrong post (points to other post). To comment on this post despite the sad ending I am happy Tatiana had a little bit of love and puppies before her life ended. I just read a wonderful book called The Secret Wife by Gill Paul in which Dmitri and Tatiana survive. It is bittersweet, beautifully written and historically sound. It spans over 100 years and ties in the comtemporary and the past in a fascinating way. I couldn’t put it down. I encourage you to read it. I has inspired me to find more about them. I have also just finished this book. Thank you to the author in bringing to back to life this story. Im reading that same book now and decided to do some research! I am listening to the audible book now. It is very hard to put down. Have 3 hours left. I have thoroughly enjoyed this book. I’ve been doing some research on the Romanovs also. Very interesting and tragic story. I also read the secret wife. It was a great book. I rather like that story line instead of Tatiana and Dimitri being killed at such young ages. I love it now that I have real faces to the names in the book. Of now to read the rest.. I have read that book too. It was awesome. I am going to read it again. Currently reading The Secret Wife. My heart goes out to Dimitri. I am looking for a book about Tatiana and Dmitri’s love story and the killing of the Romanovs. It’s “The Secret Wife” – a wonderful book!!! I’m about halfway through the book. I stayed up late last night reading and woke up thinking about the Romanov’s and that time period. I started reading about them first thing this morning. I love history but admit I do not know much about that time in Russia. I, too, am in the middle of reading The Secret Wife. Although I realize that it is a fictionalized history of Tatiana and Dmitri, I am still enthralled by it. I’m not a history buff, but this book just might change that!